I was blessed to grow up in the same hometown as my paternal grandparents. They lived on a large, wooded patch of land, and a stream meandered right through the middle of their property and under a little bridge halfway down their driveway. I remember, as a child, thinking there could surely be nothing as magical as having your very own stream. My brother, cousins and I spent so much time there, jumping across it (and occasionally landing in it), racing leaves and sticks down it, and the most daring of us (not me) actually crawled under the dark tunnel created by the bridge. 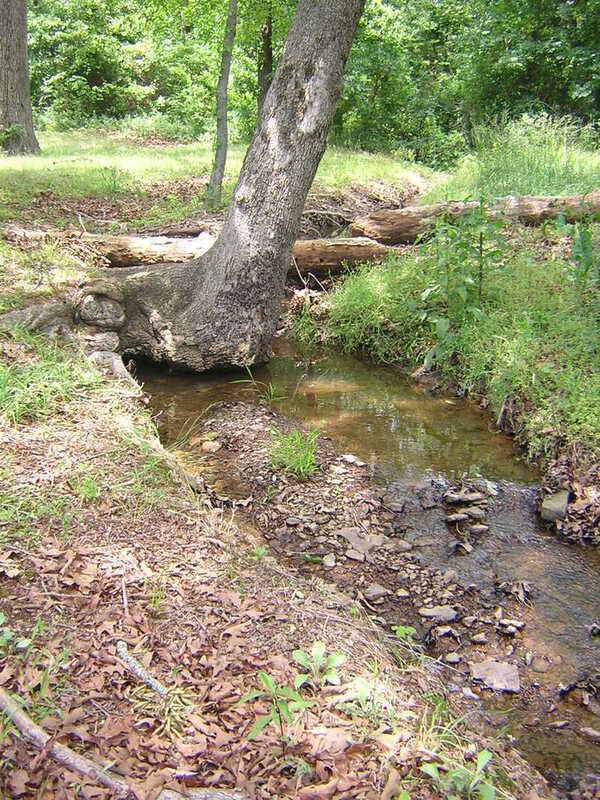 But my favorite memory of my grandparents’ little stream is a remarkable tree that grew out of its banks. The base of the tree actually grew sideways out of the bank for about two feet, then the trunk shot straight up, forming a perfect "L". And forming a perfect ledge for a young girl to sit on while swinging her legs over the creek below. On playful days, it was a perfect perch for watching "leaf races"–we sailed them right under the tree. On quieter days, the tree grew at a perfect angle to allow an imaginative child to lean back, close her eyes, and think of things as equally magical as a sideways-growing tree. I’m quite sure that some of my best thoughts were thought sitting right there. My grandparents are no longer with us, and that tree is owned by someone else. Owned by someone else, but I like to think it still belongs to me. I still go there, in my mind, when I need a place to breathe and think quiet thoughts. And in my mind, I dangle my seven-year-old legs over the side, or I rest my twelve-year-old head against the sturdy trunk–because in remembering that tree, I remember the girl I was there. I love this post, Shannon. I can just imagine you as that little girl at 7. What a beautiful place. Have a great day! I loved reading this, and the picture of the tree. Wish I could daydream there sometime. I can picture vividly the stream and the tree. It is beautiful to have such an image of childhood to return to whenever you like! Aren’t the childhood places we hold in our hearts just the best? Memories are so wonderful and I love your tree. That is magical. I would love to have a tree like that. I can just imagine all the wonderful afternoons spent there. Thanks for sharing that! you were so fortunate!! What a beautiful place. This is a lovely post. I grew up in the country and we had a stream in our back yard…so I can definately relate. I have many memories of playing, spashing, through the stream…. I also had a favorite tree. It was a popcorn tree and I would climb it and sit and read or listen to my walkman, even when I was a teenager. What a neat memory! We lived for a year in a home with groves of trees, and I loved to climb my tree and stay hidden … even at 15. There is something about a grown tree that is magical! How cool is that!!! I want to play along on this too. I will catch up next week. I bet you had soooo much fun there!